Dr. Adel Al-Hezmi will present at the M2M Summit 2015 themed: “Smart Connect – The fascination of IoT (Internet of Things)“. Title of his presentation is: “Enabling reliable communication for emerging M2M/IoT applications”. The talk centres on the different technical challenges resulting from the implementation of emerging IoT/M2M applications (e.g. Industrial Internet, Automotive, Health, etc.). It will also introduce several approaches and technologies that can fulfil the associated requirements and provides an overview of potential tools developed at the Fraunhofer Institute FOKUS. 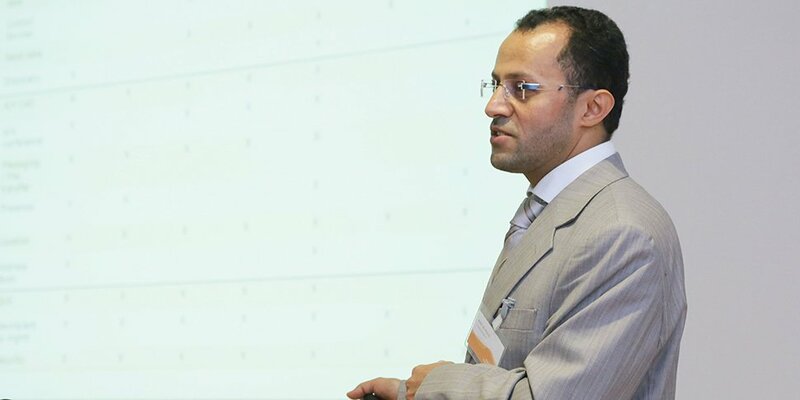 Dr. Adel Al-Hezmi is a senior researcher at the Next Generation Network Infrastructure competence centre at Fraunhofer FOKUS. He is leading the research activities for machine type communication and IoT. His expertise covers fixed and mobile core networks, M2M and multimedia service platforms. Al-Hezmi started his working experience at Siemens ICM in 1999 and then joined Fraunhofer Fokus in 2003. Then he moved to Saudi Telecommunication Company (STC) as IMS/NGN expert in network design from 2008 to 2010. Thereafter, he worked as senior solutions architect in the Qatar Mobility Innovations Center (QMIC) in Doha until 2012. He holds his diploma (master) in electrical engineering and PhD. (Dr.-Ing.) in electrical engineering from the Technische Universität Berlin (TU-Berlin) with specific emphasis on telecommunication engineering and networks. He is involved in several international research projects in ICT and continuously publishes papers and organizes workshops and international conferences. The event will be held on September 8 and 9, 2015 in Düsseldorf, Germany.